I walk for my Grandma Watson. As Community Liaison at Atlantic Shores Retirement Community in Virginia Beach, I witness the sadness of Alzheimer’s regularly. Wife of over 65 years, Mother of 7, grandmother of 14, Great Grandmother of 18 and Great Great Grandmother of 2, Grandma Watson has always been the gate keeper of family information and the teacher of so many trades. If I needed to know Uncle Tom’s age, birth date and phone number, she could tell me off the top of her head. The time I was lost driving home from my first big girl job in Chicago, without hesitation (or technology) she was able to successfully and safely navigate me home. She taught me how to sew. She taught me how to play cards. She taught my oldest cousin Jason how to box to defend himself against school bullies (when he was in 7th grade-true story). But most importantly, she taught us to never stop learning and to never stop having fun! At age 70 she was going to the water park and riding down all the slides! I walk to honor my Grandma Watson, the woman who had the sharpest mind and smartest wit of anyone I knew until Alzheimer’s stole it away. 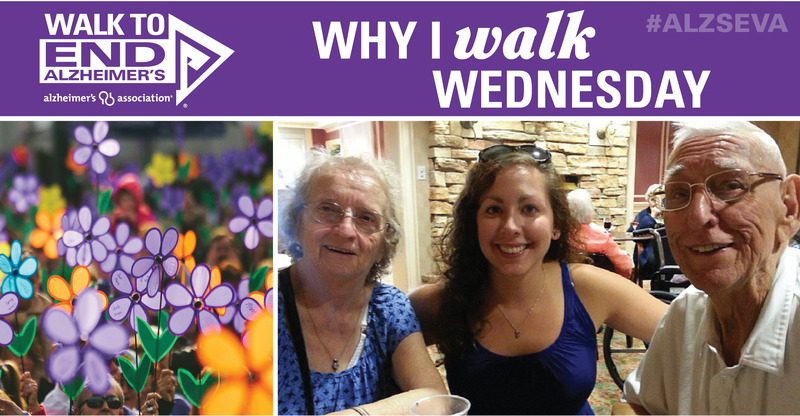 Even in her memory care unit now, she has been known to escape for a short walk to McDonald’s, “just to get out and do something.” So, today I will get out and do something for her, and for all others whose mind and spirit have suffered because of Alzheimer’s disease. Such a great story you have shared here! It’s always so great when a person growing up has that one person who seems to have all the answers and I am happy she has been there for you!